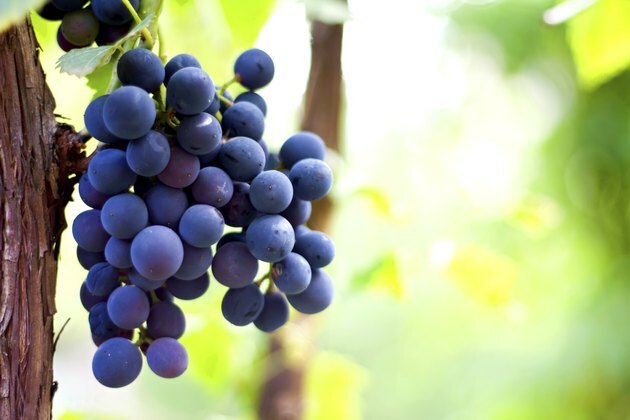 The plant compound resveratrol has been linked to an array of health benefits, including cancer prevention, protection against cardiovascular disease and longevity. However, most research done on resveratrol has been limited to the laboratory and clinical trials are lacking. Nonetheless, foods containing resveratrol are generally healthy and consuming them may benefit health in many ways. The skins of grapes contain high levels of resveratrol and this compound may be behind some of the beneficial effects associated with the consumption of red wine. Because red wine spends more time in contact with the grape skins than white or rose wine, it has higher levels of resveratrol. Of all types of red wine, the varieties produced from Pinot Noir and St. Laurent grapes have the highest levels of resveratrol, according to a 2007 study in the journal "Food Chemistry." These wines have up to 14.3 milligrams of resveratrol per liter, or 0.29 to 1.89 milligrams per 5-ounce serving. Red grape juice also has significant levels of resveratrol, between 1.14 and 8.69 milligrams per liter, or 0.17 to 1.30 milligrams per 5-ounce serving. Some types of berries contain appreciable levels of resveratrol. Bilberries and blueberries are particularly good sources. An average of 140 picomoles per gram were found in highbush blueberries from Michigan and 71 picomoles per gram in bilberries from Poland, according to a 2003 study in the "Journal of Agricultural and Food Chemistry." However, the same types of berries from other locations, such as highland blueberries from British Columbia, Canada, had significantly lower, or even undetectable, levels. Baking the berries reduced the resveratrol content by up to 46 percent. Peanuts supply resveratrol as well, although at lower levels than grape products or berries. A 1/4-cup serving of raw peanuts has between 0.0025 and 0.065milligrams of resveratrol. In a 1/4-cup serving of boiled peanuts there are between 0.08 and 0.32 milligrams of resveratrol. Peanut butter supplies 0.04 to 0.13 milligrams of resveratrol per cup. Although the specific amounts have not been quantified in other peanut products, using peanut flour or peanut oil may also be a way to include resveratrol in your diet. What Are the Health Benefits of Rose Wine? How Much Red Wine Do You Need to Get Enough Resveratrol?